The Wilga is Polish “Ivolga”. Indeed, this iisna white-winged machine with widely spread wings and forward, powerful paws-chassis resembles a bird, aimed ia a rapid breakthrough. A “character” at the “Wilga” is acknowledged by all who flew it, — the peace. As, however, and her lesson. 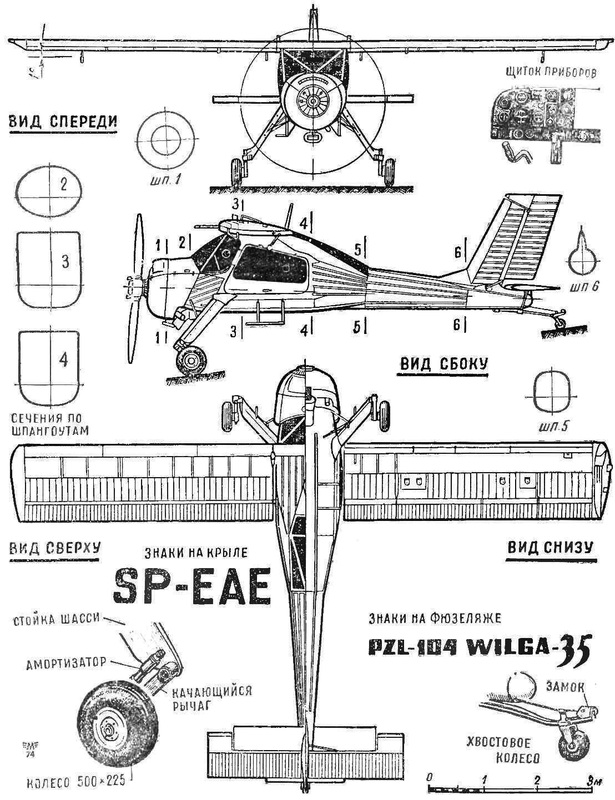 “Wilga” — light aircraft, which is widely used for various purposes in the Polish CAF. I have repeatedly seen photos of the baby hardworking in Polish magazines, especially Razumov gay, popular among young people, panorama weekly “Skrzydlata Polska”, seen in the newsreels. A first acquaintance with the representative of the family “wilg” occurred at the airport of the Central League club dropped the edge, in Warsaw. This “Wilga” was a hard worker. Cleaned and washed, carefully tinted, it nevertheless bore the traces of frequent flying, loving, but not very skillful treatment. And no wonder: “my”, “Wilga” was a training machine with dual steering. Seen more than a dozen new pilots with trembling excitement for the first time planted-si in her right comfortable chair, put his feet on the pedals, brlsi at the helm. For the first time! 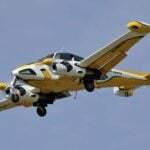 Is one of the latest versions of “Wilga”, says head of Department of modeling of the Main control flying club Zdzislaw Shaevskaya. Its prototype made its first flight on 1 June 1953. Since then, much has changed in the car. She has become more reliable, easier to manage. Soviet engine AI-14 have increased the range of its flight, increased maneuverability. Now the outlines of the “Wilga” become quite familiar in the Polish sky. However, not only in Polish. “Wilga”-farming feels in the sky, the GDR, Hungary, Romania. Even in faraway Indonesia Polish plane has received a permanent residence permit: it is produced there under license. You can add that in 1964, “Wilga” has established a record of Poland for aircraft in this class, rising into the sky at 6836 m. Its various modifications than once participated in the international air show, performed demonstration flights in Europe. A — General view of the model: 1 — wing 2 — slat, 3 — elastic band that secures the wing to the fuselage, 4 fuel tank, 5 — hood b — propeller. 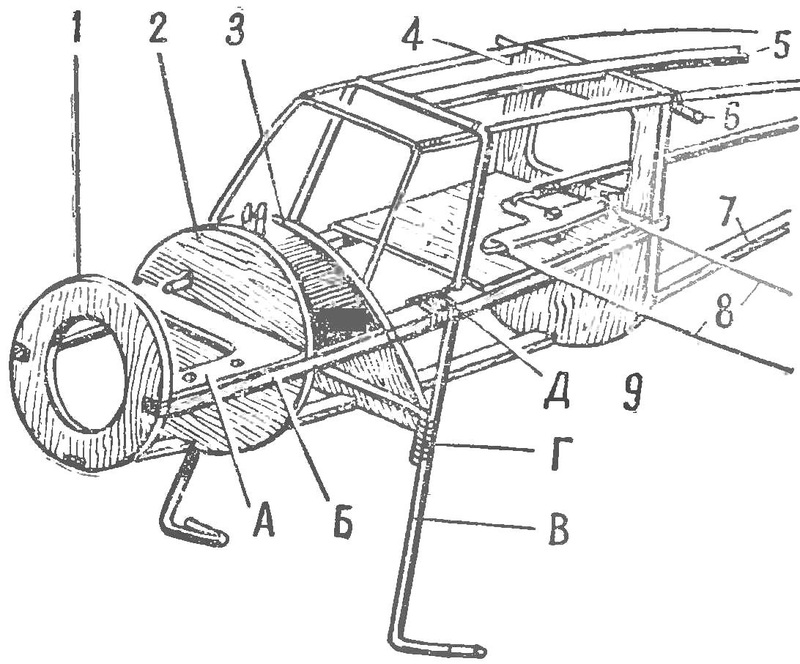 7 — engine 8 — landing gear fairing (lime or plastic), a 9 — rocker control, 10 — leads, 11 — support plate (Plexiglas), 12 — lugs leashes, 13 — landing light, 14 — wing aeronautical fire, 15 — tie rod, 16 — pylon rudder; B — rib wing and stabilizer; In — design tail wheel: 1— jumper, 2 — castle (tin), a 3 — wheel foam-rubber, 4 — plug wire OVS Ø 1.5 mm; G — hinge design of the Elevator: 1, 3 — loops of tin, 2 — axis (pin); D — control arm model (plywood with a thickness of 10-12 mm); E — rocker control; Rail wheel design: 1 — bushing (brass), 2-4 disks (duralumin), 3 — wheel, of cellular rubber, of 5 — the sleeve nut; 3 — landing gear (wire OVS Ø 2.5 mm); And templates propeller, front and side views. A template of the fuselage side view and a top (plywood 3-5 mm). B — connection patterns for frame nerd: 1 and 2 — glued the templates, 3 — polosamote frame top, 4 — polosamote frame bottom. 1-4 — frames, 5 — upper stringer of the fuselage, 6 — pin wing mounting (wire or bamboo), 7 — lower stringer of the fuselage, 8 — leashes rocking management; — sub frame (plywood), B — the sub bar (beech, hornbeam) — landing gear (wire OVS Ø 2.5 mm) G — mount jumpers, D — mount under engine block to the wire frame. Where not only used “Wilga” in our day. On the same field flying club, near the training are the cars with red crosses on the tail and the fuselage — an air ambulance. Widely used “Polish Oriole” as liaison aircraft, air taxi. This aircraft is available in two versions: with the engine “continental 0-470 L” with a capacity of 225 HP and with our An-14 260 HP (“Wilga-35”). Many athletes are willing to copy the “Wilga” as córdoba and Svobodnaya model. One of the production versions of this model are published in this issue. The materials on the plane submitted to the editorial Board of the journal “Skrzydlata Polska”. 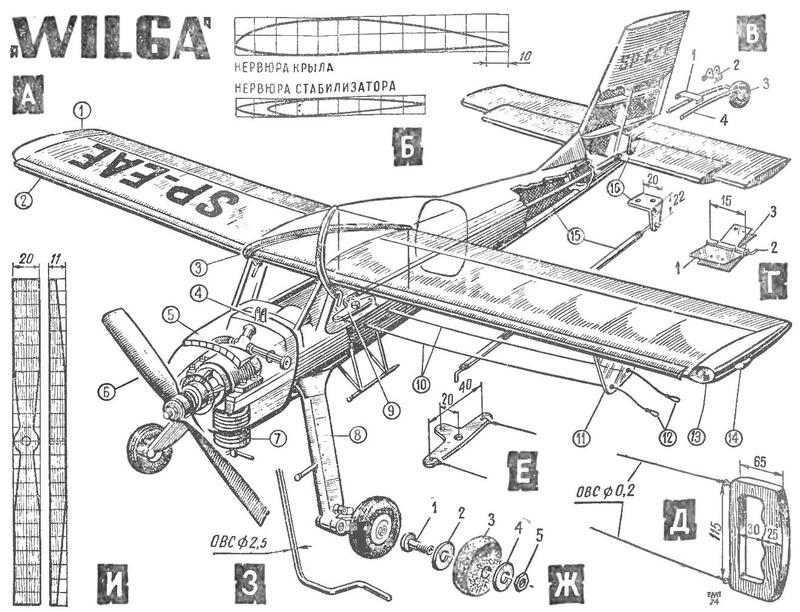 “Wilga” is a good prototype for the construction of flying models. (The overall layout of the model in Fig. 1.) Here the Modeler has the ability in All its splendor to show their skills, because the design of the “Wilga” can best be reproduced using modern materials — fiberglass, synthetic resin, foam and such advanced technologies as Vilejka of a number of parts with special forms. The use of veclachi allows you to completely get rid of outdated and labor-intensive methods of manufacture of parts, gouging of wooden discs, punch sheet metal and so on., while giving the possibility of making several identical products. Details flying models, made of fiberglass have a number of advantages compared to the dugout or patterned: they are quite prone to atmospheric influences, have an extremely high mechanical strength at a low weight and does not deteriorate from exposure to combustible mixtures and are easy to repair. Leading aeromodellers of our country has already appreciated the method of veclachi of fiberglass on the basis of synthetic binder and widely used it in their designs. This technology is called fiberglass. Therefore, we believe the development of a method of veclachi today simply required for any Modeler who wants to learn how to obtain a new, lightweight and durable product. Primarily made of fiberglass are made large parts of flying models: fuselages, engine nacelle, outboard of the cab and tanks, chassis fairings, engine cowls, etc. 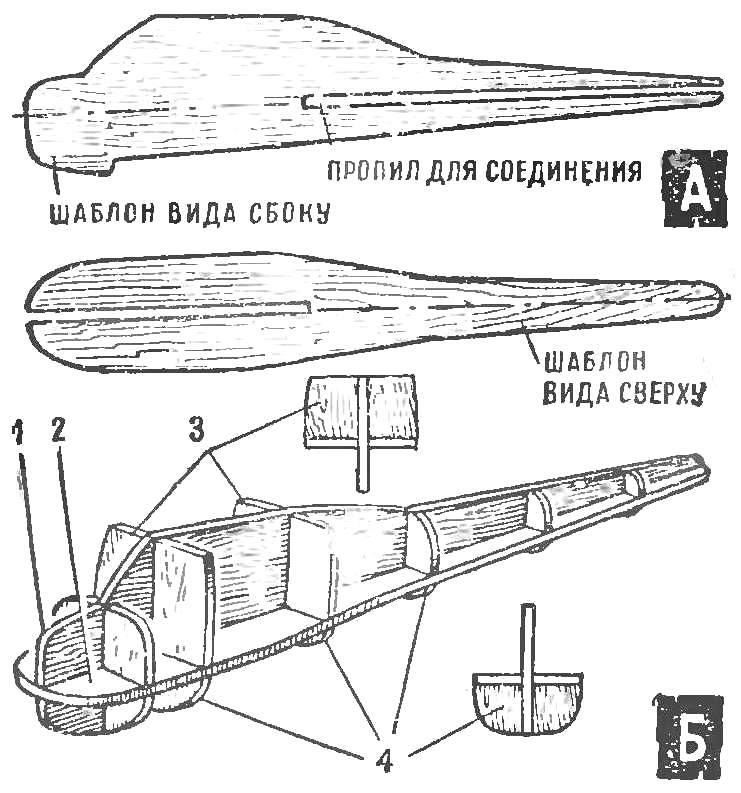 Method vyklicky in a nutshell can be described as building the model “backwards”: first is made of shell (“shell”), and then all the internal filling, which is glued in place and gives the product the necessary strength. “Shell” can be either solid or split — depending on what the requirements it imposed. For example, in the fuselage of radio controlled models can be made removable hatches or garrote any form for equipment installation. We do not accidentally said “any shape”: GRP allows to produce even complex parts such as closed pipelines, intake and exhaust manifolds or venting channels for cooling the engine. Fig. 4. 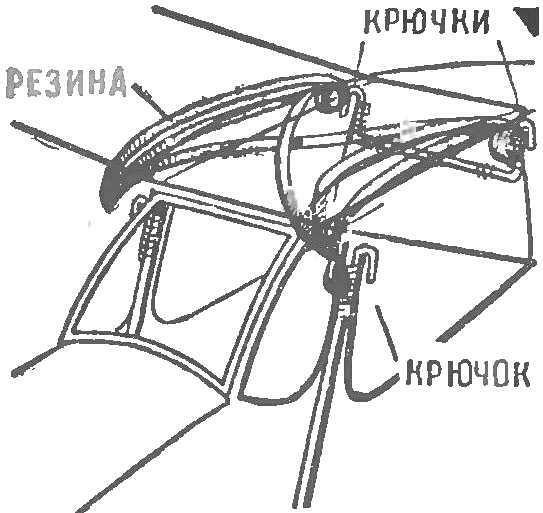 Assembly of the wing. Fig. 5. Mount the wing to the fuselage with rubber bands. Fig. 6. Engine mounting cylinder down. For the production of “skorlupka” fuselage “Wilga” of fiberglass, you must first make it precise and rigid model. The weight of this model is immaterial, so its manufacture can be used any available materials. First, the plywood templates are cut side view and top view (Fig. 2). These templates should be applied to the centreline, by which they are connected to each other and In a position to stick together. Thus, it turns out the base of the fuselage. The final shape it becomes after gluing into place samotnych framework (Fig. 2B) and fill gaps between pieces of foam or clay. Selecting the placeholder should provide the possibility of its removal after the shell will be prepared: the clay is removed by heating the foam — pomashu with acetone, which dissolves it, causing damage to the fiberglass. After openings are filled, the form is carefully calibrated and the surface of it “is smoothed” by bedding clay to obtain an exact match to the shapes of the aircraft. Now you are ready to Vileika of the shell. But you first need to decide how many of them will be made: one or several. Practice has shown that it is advisable to applied to the wall a few shells, even if decided to make only one model: the Builder will have a good reserve in case of an accident. So, we need to consider the possibility of the connector shell, its divisions, in order to remove it from the mold without destroying the last. The connector shell is best done by longitudinal vertical axis. It would result in two halves, both sets of the plastic parts available on the market. But if in sets half of the fuselage is just glued around the perimeter, then flying models inside of the shell when it is obligatory to fill in gluing reinforcing elements. The model airplane “Wilga” the main element is sangota frame carrying the landing gear. Its upper part is attached to the center section of the wing. The frame is shown in figure 3; it should be made of wire OVS Ø 2.5 mm and very carefully soldered at nodes G and D. Beech bars B of the wire frame is connected with a plywood sub frame And plywood frames No. 1, 2 and 3, forming a rigid Central section of the model that lays its main elements: engine, wing and tail section. The wing and tail model airplane “Wilga” made as usual — stacked method, with ribs from plywood in the thickness of 1-1,5 mm pine spars. (See. Fig. 1 and 4.) For easy transport model wing it is desirable to make easily removable, using mounting system shown in figure 5, or any other proven. The tail Assembly is glued to the fuselage tightly. The Central rocking of the control model is located inside the fuselage, in place of the pilot’s seat; it has two leash of steel wire, Ø 0.2 mm, which pass through the wall of the fuselage and a plate of Plexiglas, 2 mm thick, strengthened on the left wing, and connected a hard wire or a wooden rod with a horn rudder. The design of these nodes are shown on the General layout of the model. Gear wheels are made of porous rubber on a wooden or metal disks. 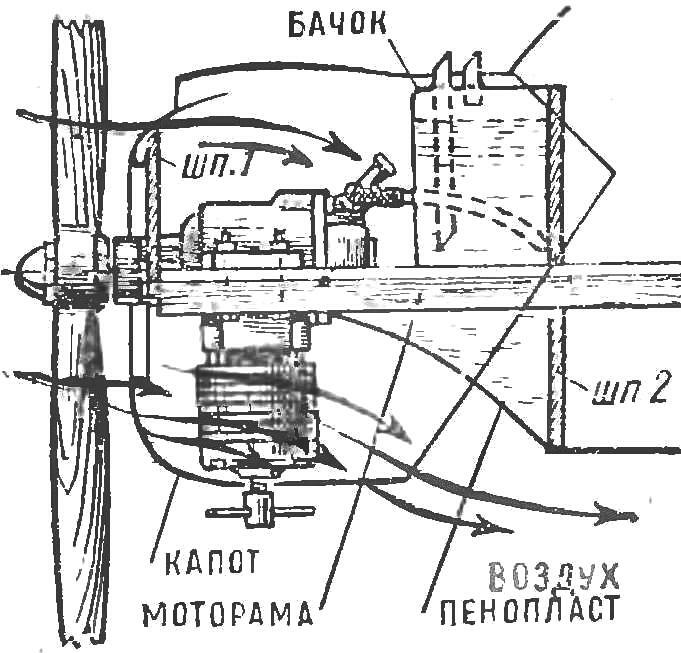 Engine MK-12B (or “Rhythm”) is established on under engine frame cylinder down as shown in figures 1 and 6. This will make the upper part of the hood, smooth, in accordance with the shape of the hood of the plane. Coloring parts of the model, made of fiberglass (the “Wilga” is the fuselage and the engine cowl), perform airbrush (spray) liquid nitroglyptal paint, thin layers 2-3 times. The wing and tail can be painted in any way, pre-covered paper close-fitting two layers of liquid Amalita.